Formulated to combat breakouts, Aveeno Clear Complexion Correcting Treatment is a discontinued product from a beauty company recognized primarily for its products for sensitive skin. In recent years, Aveeno has introduced a variety of other collections to its lineup, including products for hair, shaving, babies and acne-prone skin. A beauty product may linger on the shelves for quite a while before a company decides that its sales are too low to warrant further production. 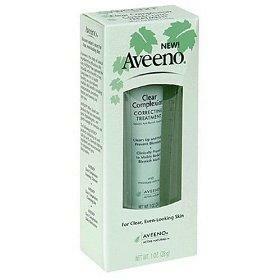 This was the case with Aveeno Clear Complexion Correcting Treatment. Packaged in a sleek, one-ounce tube, this treatment was formulated to reduce the discolored, red or dark marks left on the skin by blemishes and treat existing breakouts. The company touted its unique formula, which included salicylic acid (a common pimple-busting ingredient), vitamin A and total soy complex, which worked together to even out skin tones, prevent breakouts, reduce existing blemishes and, over time, reveal healthier, acne-free skin. The product's usage directions stated that it should be used one to three times per day on freshly cleansed skin. Since salicylic acid can be drying and cause discomfort, peeling or dryness, the company also recommended that usage could be reduced to once per day or once every other day, as well. Unfortunately, as mentioned, the product is no longer manufactured by Aveeno, and is no longer available in stores. That said, it does occasionally show up for sale on eBay. It is also available from time to time at Nutritional Supplement Product. Clear Complexion Daily Moisturizer: Perfect for everyday use, this lightweight, fast-acting facial moisturizer does more than just prevent breakouts and heal acne-damaged skin. Thanks to the vitamin C-rich soy content, it also boasts powerful antioxidant properties, which work to reduce the harmful effects of free radicals in the environment. Over time, this can even prevent the onset of fine lines and wrinkles. Clear Complexion Foaming Cleanser: Before moisturizing, cleanse the skin with this mild yet effective foaming wash. Just like the moisturizer, it's loaded with beneficial soy ingredients that help the skin maintain its optimum health. Since it's mild, oil-free and hypoallergenic, it won't strip the skin of its natural oils or clog the pores, and is gentle enough to use every day. Clear Complexion Daily Cleansing Pads: Swipe these double-sided pads onto your skin and reap the benefits of the Clear Complexion soy and salicylic acid complex. Both sides are premoistened with the formula, but each side performs a different function. Use the textured side to exfoliate and slough away dead skin, and use the smooth side to cleanse away oil, dirt, makeup and debris, which will prevent clogged pores and breakouts over time. Just like the cleanser, it is also oil-free and hypoallergenic, and it's excellent for sensitive skin thanks to its soap-free formula, too. Clear Complexion Bar: For individuals who prefer bars to liquid cleansers or pads, this hypoallergenic cleansing bar will work magic on the skin by keeping it clean, even and acne-free. Since it's soap- and oil-free, it's ideal for anyone to use, from the oiliest to the most sensitive skin types. Clear Complexion Cream Cleanser: New to the lineup is a unique cleanser that is rich and creamy, so it's perfect for individuals who suffer from dry skin. Also milk, hypoallergenic and oil-free, it does more than just remove makeup and prevent breakouts with salicylic acid; it also gently exfoliates the skin and sloughs away rough, dead skin.